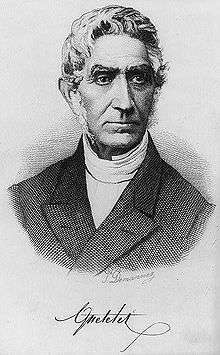 Lambert Adolphe Jacques Quetelet (French: [kətlɛ]; 22 February 1796 – 17 February 1874) ForMemRS was a Belgian astronomer, mathematician, statistician and sociologist. He founded and directed the Brussels Observatory and was influential in introducing statistical methods to the social sciences. His name is sometimes spelled with an accent as Quételet. He developed the body mass index scale. Adolphe was born in Ghent (which, at the time was a part of the new French Republic), the son of François-Augustin-Jacques-Henri Quetelet, a Frenchman and Anne Françoise Vandervelde, a Flemish woman. His father, François, was born at Ham, Picardy, and being of a somewhat adventurous spirit, he crossed the English Channel and became both a British citizen and the secretary of a Scottish nobleman. In that capacity, he traveled with his employer on the Continent, particularly spending time in Italy. At about 31, he settled in Ghent and was employed by the city, where Adolphe was born the fifth of nine children, several of whom died in childhood. Francois died when Adolphe was only seven years old. Adolphe studied at the Ghent lycée, where he started teaching mathematics in 1815 at the age of 19. In 1819 he moved to the Athenaeum in Brussels and in the same year he completed his dissertation (De quibusdam locis geometricis, necnon de curva focal – Of some new properties of the focal distance and some other curves). Quetelet received a doctorate in mathematics in 1819 from the University of Ghent. Shortly thereafter, the young man set out to convince government officials and private donors to build an astronomical observatory in Brussels; he succeeded in 1828. He became a member of the Royal Academy in 1820. He lectured at the museum for sciences and letters and at the Belgian Military School. In 1825 he became correspondent of the Royal Institute of the Netherlands, in 1827 he became member. From 1841 to 1851 he was supernumerair' associate in the Institute, and when it became Royal Netherlands Academy of Arts and Sciences he became foreign member. In 1850, he was elected a foreign member of the Royal Swedish Academy of Sciences. Quetelet also founded several statistical journals and societies, and was especially interested in creating international cooperation among statisticians. He encouraged the creation of a statistical section of the British Association for the Advancement of Science (BA), which later became the Royal Statistical Society, of which he became the first overseas member. In 1855 Quetelet suffered from apoplexy, which diminished but did not end his scientific activity. He died in Brussels on 17 February 1874, and is buried in the Brussels Cemetery. His scientific research encompassed a wide range of different scientific disciplines: meteorology, astronomy, mathematics, statistics, demography, sociology, criminology and history of science. He made significant contributions to scientific development, but he also wrote several monographs directed to the general public. He founded the Royal Observatory of Belgium, founded or co-founded several national and international statistical societies and scientific journals, and presided over the first series of the International Statistical Congresses. Quetelet was a liberal and an anticlerical, but not an atheist or materialist nor a socialist. The new science of probability and statistics was mainly used in astronomy at the time, where it was essential to account for measurement errors around means. This was done using the method of least squares. Quetelet was among the first to apply statistics to social science, planning what he called "social physics". He was keenly aware of the overwhelming complexity of social phenomena, and the many variables that needed measurement. His goal was to understand the statistical laws underlying such phenomena as crime rates, marriage rates or suicide rates. He wanted to explain the values of these variables by other social factors. These ideas were rather controversial among other scientists at the time who held that it contradicted the concept of freedom of choice. His most influential book was Sur l'homme et le développement de ses facultés, ou Essai de physique sociale, published in 1835 (In English translation, it is titled Treatise on Man, but a literal translation would be "On Man and the Development of his Faculties, or Essays on Social Physics"). In it, he outlines the project of a social physics and describes his concept of the "average man" (l'homme moyen) who is characterized by the mean values of measured variables that follow a normal distribution. He collected data about many such variables. When Auguste Comte discovered that Quetelet had appropriated the term 'social physics', which Comte had originally introduced, Comte found it necessary to invent the term 'sociologie' (sociology) because he disagreed with Quetelet's collection of statistics. Quetelet was an influential figure in criminology. Along with Andre-Michel Guerry, he helped to establish the cartographic school and positivist schools of criminology which made extensive use of statistical techniques. Through statistical analysis, Quetelet gained insight into the relationships between crime and other social factors. Among his findings were strong relationships between age and crime, as well as gender and crime. Other influential factors he found included climate, poverty, education, and alcohol consumption, with his research findings published in Of the Development of the Propensity to Crime. In his 1835 text on social physics, in which he presented his theory of human variance around the average, with human traits being distributed according to a normal curve, he proposed that normal variation provided a basis for the idea that populations produce sufficient variation for artificial or natural selection to operate. In terms of influence over later public health agendas, one of Quetelet's lasting legacies was the establishment of a simple measure for classifying people's weight relative to an ideal for their height. His proposal, the body mass index (or Quetelet index), has endured with minor variations to the present day. Anthropometric data is used in modern applications and referenced in the development of every consumer-based product. Quetelet was elected a Foreign Member of the Royal Society (ForMemRS) in 1839. The asteroid 1239 Queteleta is named after him. 1823. Relation d'un voyage fait à la grotte de Han au mois d'août 1822'. 'With M.M. Kickx. 1827. Recherches sur la population, les naissances, les décès, les prisons, les dépôts de mendicité, etc., dans le royaume des Pays-Bas. 1829. Recherches statistiques sur le royaume des Pays-Bas. 1831. The Propensity to Crime. 1835. Sur l'homme et le développement de ses facultés, ou Essai de physique sociale. 2 volumes. 1838. De l'influence des saisons sur la mortalité aux différens âges dans la Belgique. 1839. Catalogue des principales apparitions d'étoiles filantes. 1842. A Treatise on Man and the Development of His Faculties. 1843. Sur l'emploi de la boussole dans les mines. 1845–1851. Sur le climat de la Belgique. 2 volumes. 1848. Du système social et des lois qui le régissent. 1848. Sur la statistique morale et les principes qui doivent en former la base. 1850. Mémoire sur les lois des naissances et de la mortalité à Bruxelles. 1853. Mémoire sur les variations périodiques et non périodiques de la température, d'après les observations faites, pendant vingt ans, à l'observatoire royal de Bruxelles. 1864. Histoire des sciences mathématiques et physiques chez les Belges. 1867. Météorologie de la Belgique comparée à celle du globe. 1867. Sciences mathématiques et physiques au commencement du XIXe siècle. 1869. Sur la physique du globe en Belgique. 1870. Anthropométrie, ou Mesure des différentes facultés de l'homme. 1 2 3 "Fellows of the Royal Society". London: Royal Society. Archived from the original on 2015-03-16. ↑ O'Connor, John J.; Robertson, Edmund F., "Adolphe Quetelet", MacTutor History of Mathematics archive, University of St Andrews . ↑ "Lambert Adolphe Jacques Quetelet (1796 - 1874)". Royal Netherlands Academy of Arts and Sciences. Retrieved 20 July 2015. ↑ Piers Beirne (1987). "Adolphe Quetelet and the Origins of Positivist Criminology". In; American Journal of Sociology 92(5): pp. 1140–1169. ↑ Eiseley, Loren (1961). Darwin's Century. Anchor Books (Doubleday). p. 227. ↑ Garabed Eknoyan (2008). "Adolphe Quetelet (1796–1874) – the average man and indices of obesity". In: Nephrol. Dial. Transplant. 23 (1): 47–51. Wikimedia Commons has media related to Adolphe Quételet. Ian Hacking (1990). The Taming of Chance. Cambridge University Press, chapters 13–15. Alain Desrosières (1998). The Politics of Large Numbers: A History of Statistical Reasoning. Harvard University Press, chapter 3. Stephen Stigler (1999). Statistics on the Table. Harvard University Press, chapter 2. Philip Ball (2005). Critical Mass: How One Thing Leads to Another. Arrow Books 2005, chapter 3. Fabien Locher (2007). "The observatory, the land-based ship and the crusades: earth sciences in european context, 1830–1850", British Journal for History of Science, 40(4), 2007, pp. 491–504 (On the leading role of Adolphe Quetelet in the fields of meteorology and geomagnetism in early nineteenth-century). This article is issued from Wikipedia - version of the 5/12/2016. The text is available under the Creative Commons Attribution/Share Alike but additional terms may apply for the media files.